Decals / stickers for my Kona Hei - Hei? Post subject: Decals / stickers for my Kona Hei - Hei? 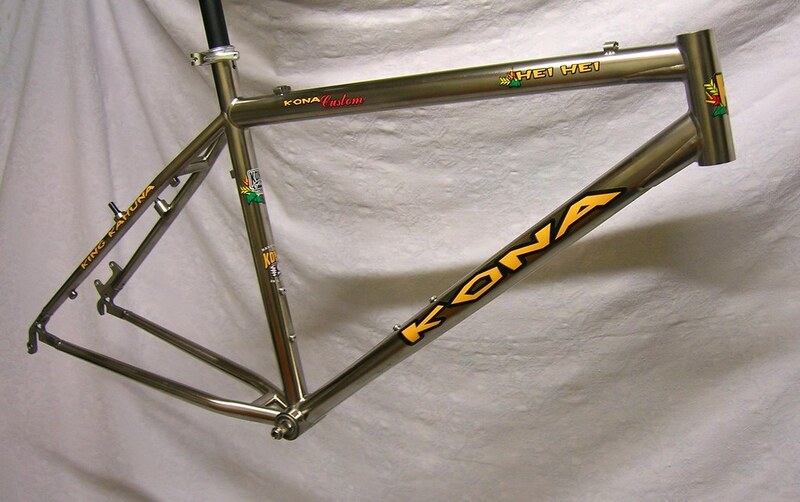 So, to my question: I have this Kona Hei - Hei (97 i think with the yellow decals / stickers). They are starting to get pretty worn out and scarred and it would be nice to replace them with a complete new set (hopefully with the 98' edition if possible). Does anyone here know if there are some shops, sticker makers or retailers in The UK which could help my out on this matter? I'm not sure which of those 3 options he prefers to be contacted by. I got my '98 Hei Hei decals from Gil. They were perfect. Suspect he'd have the '97 artwork too. Here is my 1997 King Kahuna frame after I polished it and then fitted a set of Decals from Gil. Post subject: Re: Decals / stickers for my Kona Hei - Hei?